I LOVE Korean cuisine. Everything has so much flavour with the perfect balance of spiciness, savouriness and sweetness. One of my favourite things growing up was Korean BBQ Beef bowls made with Korean BBQ Sauce. I was craving it so much and one day it just hit me how easily I can make it vegan! Since then, it’s become one of my go-to meals. 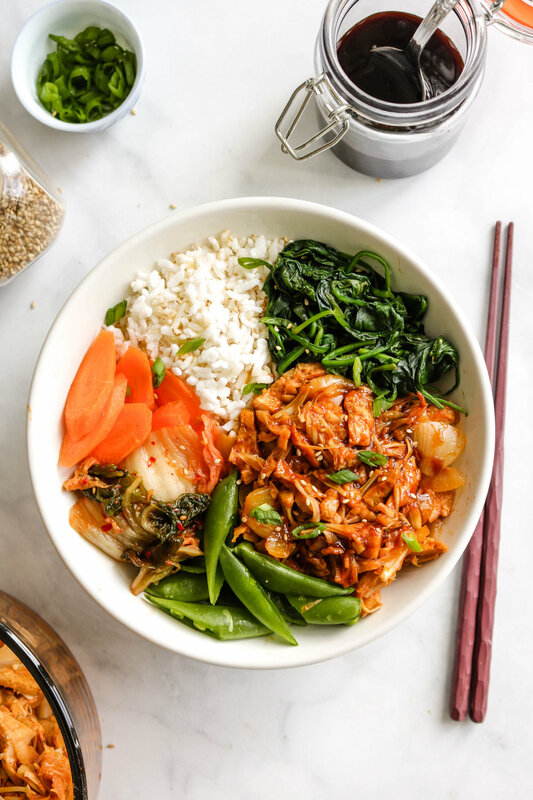 The best part about this dish (other than that is tastes soooo good) is that you only need 4 ingredients to make the actual Korean BBQ Pulled Jackfruit! If you can’t get soy curls, you can sub for more jackfruit or even tofu! If you can’t find jackfruit, you can still make this dish with soy curls or tofu, just reduce the amount of sauce. This is my go-to meal when I just want something quick and easy. Sometimes I’ll meal prep it ahead of time because it keeps well in the fridge for a couple days too! I LOVE eating it with rice, it balances the super flavourful Korean BBQ Pulled Jackfruit so well. And if you can get your hands on some Korean side dishes, highly recommend! If not, some sautéed vegetables will do, the sauce honestly makes everything tasty anyways ☺️. I’ve been craving ALL the Korean food lately so perhaps there will be more Korean recipes here on the blog, stay tuned! 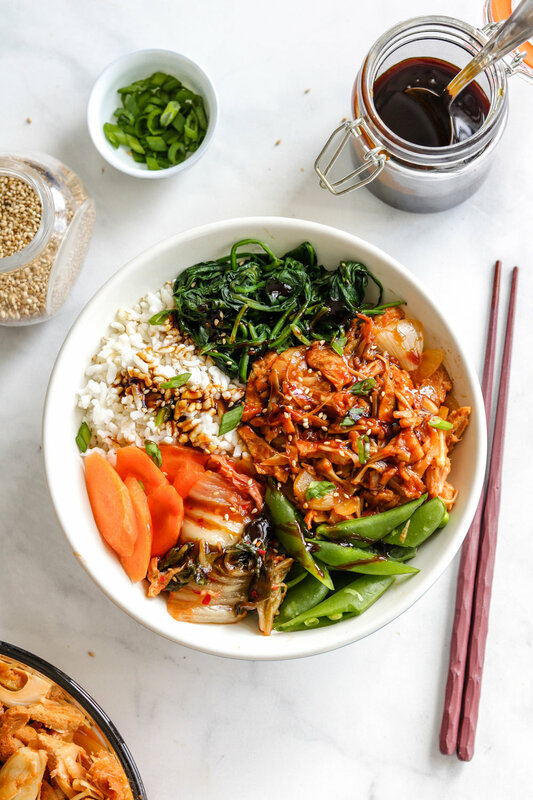 If you recreate this Korean BBQ Pulled Jackfruit please share it and let me know what you think by tagging me on Instagram @lisakitahara, I love seeing all of your tasty recreations! 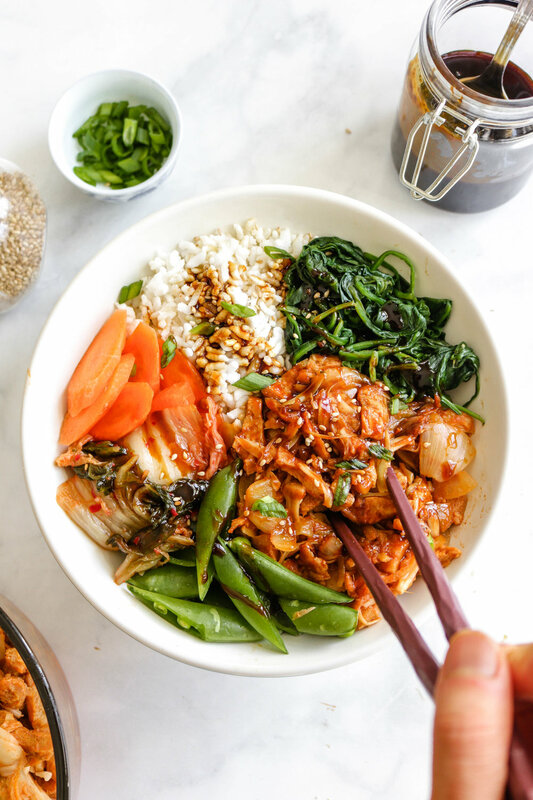 Additional korean side dishes or any vegetables you have on hand! Spinach, carrots, sugar snap peas are delicious paired with this. Add in the drained jackfruit, soy curls, BBQ sauce and water. Stir to coat all the jackfruit and soy curls. Shred the jackfruit pieces with a fork until it resembles "pulled pork". Cook for 4-6 minutes. Stir and taste. Add more BBQ sauce, salt or pepper if needed. Allow it to cook for another 2-3 minutes. Serve immediately over rice with some vegetables. Top with sesame seeds and green onions if desired. * be sure to squeeze the excess rehydrated soy curls liquid out so that it can absorb the sauce well. I used my home made Korean BBQ Sauce that is vegan & refined sugar free! Store left overs in an airtight container. It will last up to 5 days.